If you decide to visit St. Mary's Hos-pital in Taitung, be advised that you might find that most of the employees are out doing fieldwork. Bright and early at 8:30 one morning a group comprising a nun, a doctor, and a nurse are en route to care for patients in Taiyuan Village. A delivery truck bearing meals for the elderly follows not far behind. At 10 a.m. over at a day-care center in Jinfeng Township's Jialan Village a team of social workers and aromatherapists are tending to several dozen elderly Aboriginal women, leading them in activities and invigorating them with massages. That afternoon, internist Lin Jui-hsiang lectures in the community on diabetes prevention and care, and the hospital's associate administrator, Jennifer Chen, graciously leads visitors on a tour of the "health farm" and learning center, Pei-Tse Institute, both of which are scheduled to open in the near future. How is it possible then that a clearly flourishing institution has come close to shuttering its doors twice in the past seven years, was all but given a death sentence by experts, and had even its most ardent church supporters resigned to accepting its closure as the will of the Almighty? But this little hospital has undergone a resurgence and transformation that is nothing short of miraculous as they continue to build upon their dreams of being both a quality hospice and health center for all of eastern Taiwan. Its story goes back half a century to the pioneering efforts of two European missionaries. In Switzerland at the end of the 19th century, a French minister named Rev. 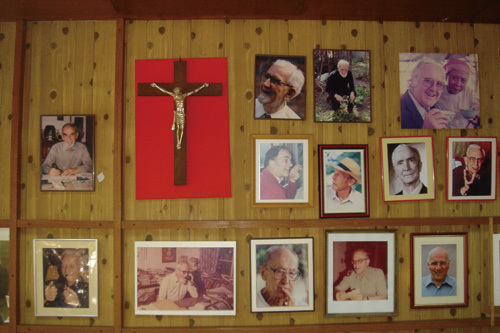 Pierre-Marie Barral founded the Bethlehem Institute, later renamed the Societas Missionaria de Bethlehem in Helvetia (SMB), an international missionary training academy. According to the society's founding precepts, the graduates of the school were obliged to do missionary work overseas in remote areas without any Christian presence. Moreover, they were to make every effort to integrate themselves into the local culture and to minister to the needs of marginalized people. In 1953, two of the society's members, Rev. Jacob Hilber and Rev. Lukas Stoffel, relocated to Taitung after being expelled from China, which following the Communist Revolution had become inhospitable towards foreign missionaries. They recruited others to come assist them with preaching the gospel in Aboriginal villages, and also poured their energies into health care, education, social work, and even linguistic and cultural studies. In 1961, after receiving funding from overseas, they built Taitung St. Mary's Hospital. In the beginning, there was only one clinic and four beds. Today, the original edifices can be seen in the interior court, a small two-story white building that is a dormitory for nuns and a chapel. At that time, Taitung had only one hospital under the auspices of the Department of Health. Medical personnel and equipment were in extreme short supply. 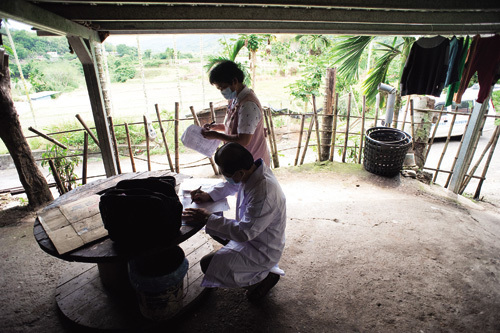 Taiwanese doctors were reluctant to practice in remote rural areas. As a result, in the beginning St. Mary's funding came entirely from overseas donations, and the hospital was staffed by foreign missionary doctors who donated their services. They also recruited two Irish nuns from the Medical Missionaries of Mary to take charge of obstetrics. 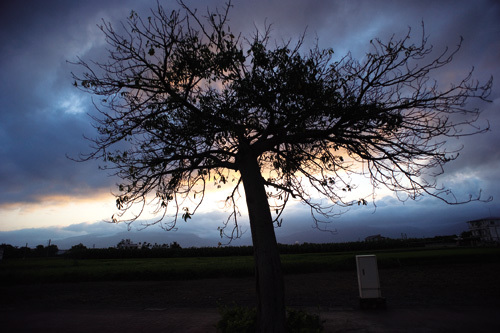 Since Taitung is home to a number of diverse ethnic groups, many languages are spoken there, including Mandarin, Taiwanese, Hakka, Japanese, and six different Aboriginal languages. Recognizing this as a serious challenge, the nuns and brothers of the hospital began training locals as nursing assistants from day one. Though they have been working for over 40 years, three assistants Zhong Guangmei, Shi Xiuying, and Huang Qiuzhen (nicknamed "Old Huang") still remember the early days. In the 1970s, they earned NT$4,000 a month, with room and board provided by the hospital. Curfew was at 9 p.m. sharp. Every week the nuns taught two nursing classes and two English classes. In the daytime, they worked in the clinic giving shots, preparing prescriptions, helping administer anesthesia, and assisting with deliveries. The nuns and brothers would schedule leisure activities to provide relief from the tightly regimented work schedule. Sometimes the group of more than 10 young ladies would go for a drive and a picnic, or on their afternoon break they would all take the bus to Shanyuan Beach to escape the heat by swimming. The biggest lesson they gleaned from all that time working in close cooperation with their teachers was, "to put the patients first and to cultivate a compassionate heart." In 1975 a French missionary organization, the Daughters of Charity, assumed stewardship of the hospital, which by that point, thanks to the diligence of the hospital staff, had matured into a women's hospital with 30 beds. Under new management spearheaded by American nun Sr. Agnes McPhee, who served as the hospital's second administrator, and another American nun who came in 1979, Sr. Patricia Aycock, St. Mary's broke new ground by introducing a domiciliary care program that is still in use today. Back in the 1970s there was a huge disparity between urban and rural resources, and transportation was underdeveloped, as well. 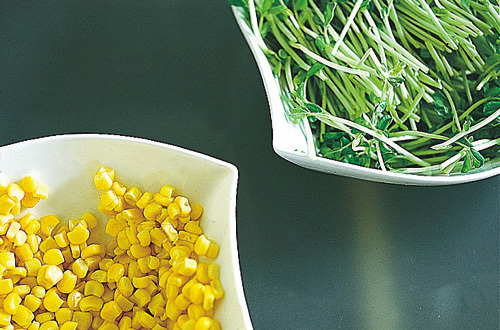 Sr. Agnes frequently made boat trips out to outlying Lanyu to educate the residents on health matters; when patients came to St. Mary's from Lanyu for treatment, Agnes would see to their meals and accommodations. 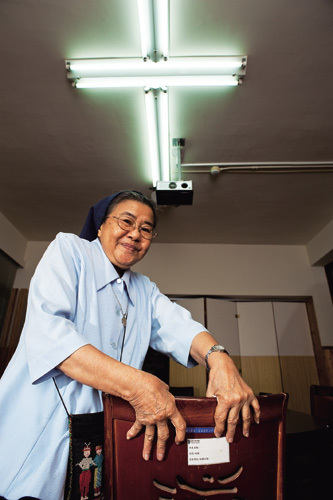 Sr. Patricia, who specialized in anesthesiology as a nursing student, was the first person to implement the "clinic on wheels" approach, though she modestly denies credit for the idea, simply stating that she was the only sister who knew how to drive. She would spend entire days driving from village to village, her car loaded up with medicines, patient files, and medical equipment. She faced the challenge of being both pilot and navigator on these trips, and moreover, as the anesthesia expert, she had to be ready to return to the hospital at a moment's notice. "I used to borrow the phones in the village churches to check in with the hospital-if there was an urgent operation waiting, I'd have to hurry back immediately," she says. Among Patricia's homecare patients are numerous poor Aborigines who became paraplegics after suffering road accidents while young due to either drinking or fatigue. Attending to them requires combining aspects of nursing (cleaning bedsores, physical rehabilitation, and even helping with laundry and cleaning) with those of social work (securing financial assistance and helping children attend school), as well as ministering to their spiritual needs. "The nuns are always reminding everybody: it's our job to do what others don't and to go where others won't," says Sense Chen, who came aboard at the end of 2006 as the hospital's CEO. Whereas the great majority of hospitals view domiciliary care in remote regions as a costly, tenuous undertaking, St. Mary's has picked up the slack, throwing itself headlong into the daunting task. 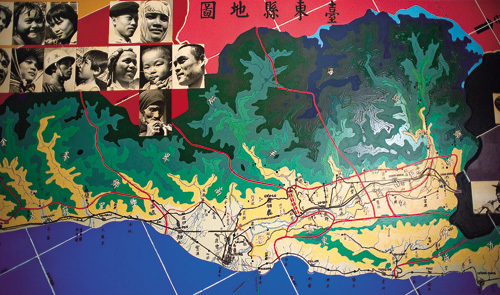 The program has expanded to the point that their operational scope now extends from as far north as Changbin Township at the border of Hualien and Taitung Counties all the way down south to the Taitung-Pingtung junction of Daren Township, a meandering 190-kilometer stretch of coastal highway. This, of course, does not include the tribal villages tucked away in the mountains that are an hour-and-a-half drive's distance, nor does it include the 150 visits per year that the hospital's staff make out to the peripheral islands of Lanyu and Green Island. While the advent of comprehensive national health insurance in the 1990s did much to make health care affordable for most Taiwanese, the conditions in remoter regions nevertheless lagged far behind. According to statistics published in 1995, Taitung County's mortality rates per 100,000 residents-irrespective of the cause of death-were considerably higher than other parts of Taiwan. Taitung also topped the lists in another unfortunate category: the incidence of malignant tumors. Even in recent years, 600 county patients enter the late stages of cancer annually, and their mean residual life expectancy is more than 10 years less than that of Taipei City residents. Moreover, in Taitung County the number of deaths of people in their prime due to accidents is high, as are instances of heart disease, kidney ailments, and other chronic illnesses. This suggests that many carry a heavy burden of toil and stress in their struggle to make ends meet, and highlights the great impact of social and economic inequality on health and wellbeing. To make matters worse, in the mid-1990s, St. Mary's Hospital, long a beacon of hope for an impoverished community, began unraveling financially, seemingly no longer able to keep up with the times. Chen examines the causes behind the hardship. Beginning in the 1980s, St. Mary's, in keeping with the Catholic faith's traditional self-reliance, began gradually weaning themselves off of foreign donations-domestic contributions have always been sporadic. Moreover, the restructuring of the medical system based on enterprise and market principles had shaken the more public-service-minded St. Mary's, even threatening their once reliable obstetrics department. Seventy-six-year-old Sr. Matilde Sansolis Serneo, the recipient of the 12th Medical Devotion Award (conferred by the Department of Health) in 2003, recalls that with the enacting of the hospital accreditation program in the 1990s, the majority of the hospitals had to scramble to fall in line with the new standards. St. Mary's was found to have a number of inadequacies; among them were disorganized management, the failure to prepare and archive their medical billing and records according to the International Classification of Diseases, substandard quality of care (including the fact that the nurses were not properly licensed), and the building was old and not in compliance with fire codes. The plainspoken Sr. Matilde takes a curt view of the situation. "When they asked me to explain the organizational structure of the hospital, I didn't really know what to say," she says. "I just told them that we use flat management. I told them we all have a number of hats to wear and that we take our responsibilities very seriously." 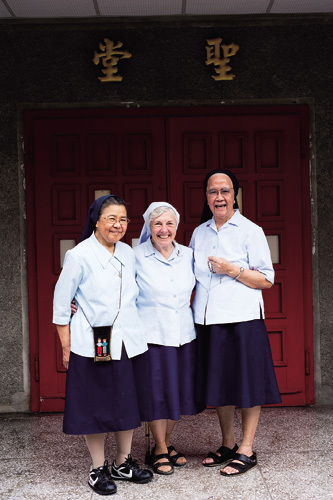 All of the nuns, she recalls, were scurrying about frantically to make the necessary improvements: one person burned the midnight oil sorting through all the medical files, another started learning how to use a computer, and yet another attended classes at the fire department. In order to get their already veteran nurses past the licensing hurdle, they arranged for teachers from nursing cram schools in northern Taiwan to come every weekend to teach. In the end, their efforts paid off: the hospital received accreditation on the third evaluation. 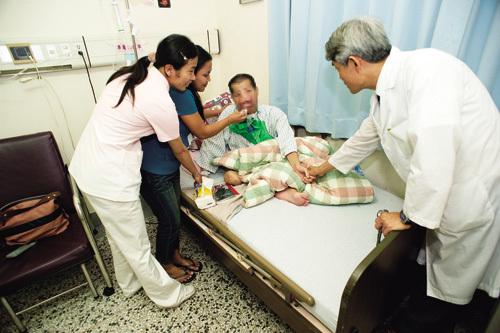 Ironically, between 1990 and 2001, the Department of Health singled out no less than six of St. Mary's employees for distinguished service awards, making the hospital the most frequent recipient of public commendation in all of Taiwan. But in 2003 its financial woes boiled over, and they found themselves unable to pay the workers' salaries; they had finally hit rock bottom and were forced to decide whether to fight on or to close the hospital's doors forever. Chen Shih-hsien well remembers the air of desperation permeating the hospital during that troubled hour. A private hospital offered to buy St. Mary's, but was only interested in the hospital buildings and the physicians; the remaining 80 employees were to be left to fend for themselves. The hospital director could not abide so inhumane a proposition. On one inclement day, as rain poured down on the hospital's dark empty corridors, the ceiling began to leak. Orthopedist Shih Shao-wei, a dedicated, irreproachably loyal physician, let out a sad sigh: "The hospital is weeping." At this critical juncture, two important church figures, Bishop Huang Chao-ming, the newly appointed head of the Hualien Diocese, and Sr. Cheng Yun, the former director of St. Mary's, provided invaluable support, and more significantly, practical counsel. The hospital needed to capitalize on its strengths-its warm familial atmosphere and concern for patients' spiritual, as well as physical wellbeing-and focus on becoming a leader for the Taitung region in the emerging fields of preventative and hospice care. In 2004, St. Mary's established the first hospice care center in Taitung, inviting former Taipei Medical University internist Fu Shan-shan and Huang Kuan-chiu, another internist with ample experience in private practice, to serve as co-directors. That very year, the Department of Health recognized their outstanding contribution. In addition, Dr. Chao Co-shi of National Cheng Kung University Hospital, the woman considered to be the mother of Taiwanese hospice care, has frequently lauded the quality of care at St. Mary's. The change of focus made it possible for St. Mary's to be reborn. 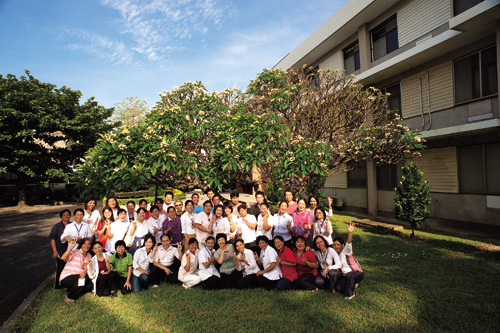 Beginning in 2005, the hospital received commendation from the Taitung County Government four consecutive years for the quality of their domiciliary care. Then in 2008 the hospital became the recipient of the 18th Medical Devotion Award in the group category, the first time in the award's history that it was given to a hospital. "Depending on your perspective, I suppose this award could be called the 'fool's award,' because only a fool would persist in doing what we've been doing under the conditions that we've been doing it-a normal person wouldn't have anything to do with it," jokes Chen. But in a capitalist society dominated by utilitarian thinking, this quixotic spirit is even more compelling, which is why it always succeeds in attracting talent and material support. 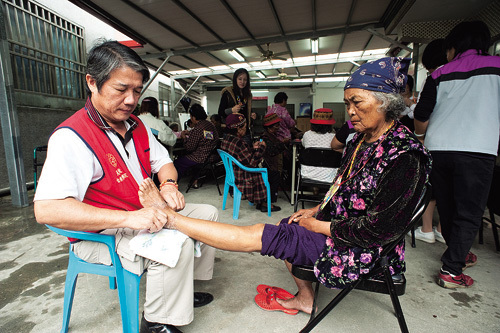 For example, five years ago Cardinal Tien Hospital's authority on diabetes, Professor Lin Jui-hsiang, flew down to Taitung on his own coin for a few days every month to help St. Mary's set up a diabetes support group, as well as to promote healthy living. He has since become a resident physician at St. Mary's. No less prestigious an individual than the former head of neonatal intensive care at Cathay General Hospital, Yuh Yeong-Seng, was willing to assume directorship of St. Mary's in 2008 after the previous director Shih Shao-wei died of cancer. Early in 2009, the executive director of Catholic Sanipax Socio-Medical Service and Education Foundation, Jennifer Chen, officially took up the post of associate administrator after volunteering for the hospital for more than 20 years. Unexpected windfalls arrived in bunches. In 2006, after making repeated entreaties, Jennifer Chen succeeded in convincing a Taitung native by the name of Shunzi to set up and run a health club on a vacant space within the hospital campus. 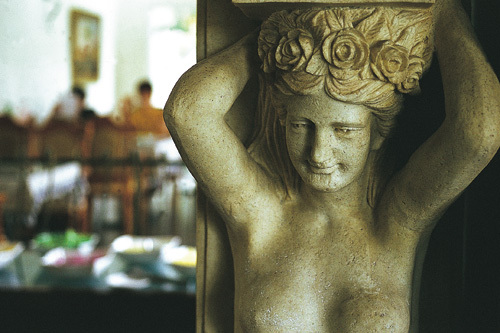 Shunzi was the proprietor of a bed and breakfast in the area, as well as a stellar cook; Chen pursued him because she admired the relaxed, congenial atmosphere of his homestay. Shunzi's interest in the venture was 12 years of management rights of the club, under a "build, operate, transfer" arrangement. Much to everyone's amazement, the perfectionist Shunzi exceeded all expectations in building a club that fused seamlessly with the hospital. In the design phase, the blueprint became more elaborate with each rendition. Construction took longer than anticipated, so Shunzi sold his homestay and invested the NT$30 million profit into the new project. 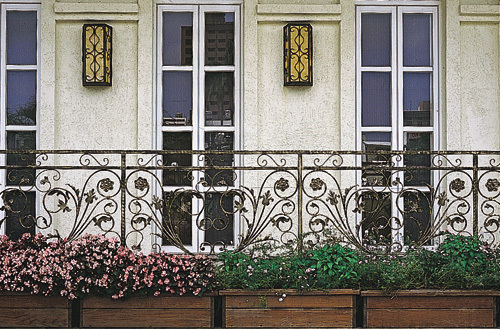 Two years later, a club much grander and more beautiful than anyone initially expected was completed. Even more unexpected was when Shunzi announced that he was relinquishing his 12-year interest in the club, saying, "Why should helping people have to wait 12 years?" Thus, St. Mary's assumed immediate ownership of the club (though they did finally reimburse Shunzi NT$9 million in gratitude for his generosity) which now provides county residents with organic food and healthy living classes at an affordable price. More good fortune was to follow. In 2007, a patient was attending a clinic for diabetics on managing blood sugar. The patient, Michael Liu, was a landscaper by profession, and the affinity he felt for the hospital was so powerful that he volunteered four months of his time working on a therapeutic garden replete with a stream and a gazebo so that patients and visitors alike may enjoy a soothing respite. "It seems that if we maintain the desire to serve the people in our hearts, kind people and good deeds will be visited back upon us," smiles the kindly and gregarious Associate Administrator Chen. This positive energy is more than just the reward of compassionate seeds planted a half-century ago: it represents a yearning in contemporary Taiwanese society for a more humane model of medicine. This is perhaps why when St. Mary's sought financing to help them become an incorporated foundation (land appreciation tax alone cost NT$16 million) in April of 2009, the hospital raised an astonishing NT$89 million from generous contributors in just eight days, far in excess of the projected goal of NT$30 million. As St. Mary's continues its march towards a shining future, it is clear that it belongs not only to Taitung-nor is it simply a hospital-it is a glowing example of the never-ending project to build a kinder, more humane society.